Only a few athletes can do it. Here’s how I think they got there. 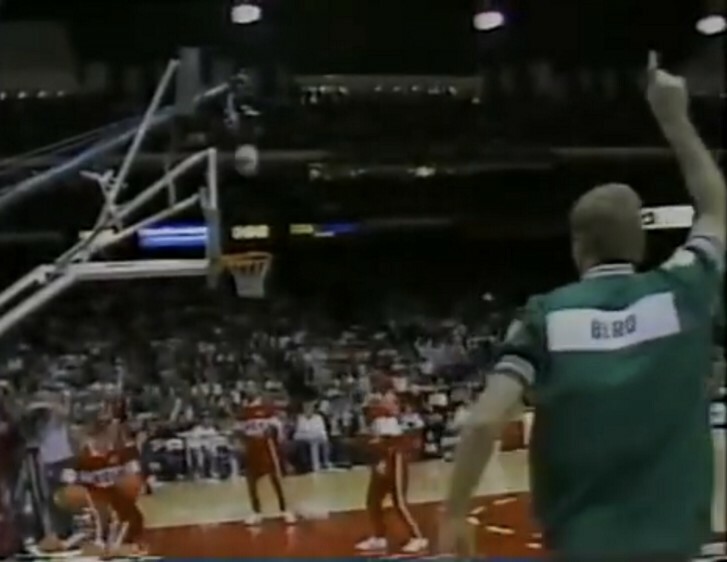 I’m watching footage of Larry Bird in a 3-point shooting contest. It’s the all-star game weekend. I always forget how great it is to see how far we’ve come in terms of style in the NBA. The 3-point shooting contest is one of my all-time favorite events. Let’s place all these racks around the three point line and watch a guy shoot them as fast as he can. Also, the last ball is worth double what all the others are. Go! When I was in the 3rd grade we would play knockout out at every lunch period. There’s a strange excitement about shooting hoops with a timer attached to it. You’re playing against time. You’re playing against yourself. And you’re playing against other people. I realize now that’s basically what we’re doing our entire adult life. I know some of you feel that. Bird is floating. He’s gliding. He’s making his way around the three point line. Swish. Swish. Swish. Brick. Swish. Swish. He gets to final rack. There’s time to spare. He shoots the final ball and you see it — you’re thinking “he’s electric right now!” The ball is pie high in the sky. Bird starts walking away, this man’s confidence is radiating through YouTube videos 30 years later. Holden Caufield is smiling. Bird is halfway back to Boston. Nothing but white hot nylon. All your practice, all your effort, all your hard work. When you’ve put in the time, it flows outward into the world. People feel it. It’s an energy, really. I’m sitting at my computer right now and before I type this last sentence I’m feeling like I need to point at the sky before the buttery smoothness of this final sentence ensues because here’s what I’m about to do: I’m about to share some passages I’ve collected over the years about my favorite athletes and how they got so good they could win before the game ended. Shoot your shot before anyone else. Being the most down to earth guy in the room. I can catch fish on my own. I will occasionally rub the Buddha’s belly. Slow people can get fast by getting good at anticipation. “As the legend goes, as a child Wayne Gretzky would, like most other boys in his home country, watch the NHL on television every chance he could get. What made him different, however, was that every time, he would sit there with a blank piece of white paper and a pencil. Without looking at the paper, eyes constantly on the screen, he would trace the path of the puck on his sheet of paper throughout the course of the game. By the end of the game, he would have a sheet of paper covered in pencil marks, and the darkest areas were where the puck spent the most time. Wait for your perfect pitch line you’re waiting for that perfect girl. I hope you enjoyed this piece. Welcome to scheplick.com! I am an investor, writer, thinker, and in my day job I study social media and digital marketing. If you like what you’re reading, I will you one final thing: join my email list. Walking Off The Court Before The Splash was originally published in Luchini In The Air on Medium, where people are continuing the conversation by highlighting and responding to this story.